While articular cartilage changes are the hallmark of OA, other joint structures including bone, ligaments, muscles, and nerves are also affected, leading to pain and physical function limitations. These functional limitations contribute to the staggering economic burden of OA. In the last decade, direct health care expenditures reached $328 billion  and more than $10 billion  in the US and Canada, respectively. The knee is the joint most often affected by OA. For adults older than 65, knee OA results in more difficulty with typical activities of daily living, such as walking and climbing stairs, than any other medical condition. However, what is more alarming is that the group of adults aged 45 to 54 years is growing more rapidly than any other age group with knee OA. There is no cure for knee OA and total knee arthroplasty is the end-stage treatment for advanced disease. Joint arthroplasty is not a practical solution for those in younger age categories as implants have a lifespan of 15 to 20 years, and patient satisfaction and out­comes dramatically decrease following revision surgery. Research­ers once thought OA was primarily a degenerative pro­cess, but the thinking over the past decade has changed to support the idea that OA is a metabolically active process that can be delayed with an optimal environment. Hence, there is an urgent need to develop interventions that delay OA progression. Disease-modifying pharmacological agents are also being developed to disrupt the imbalanced biochemical processes asso­ciated with OA  along with biological products to replace damaged tissue, but there is also a focus on altering the biomechanical environment. Based on evidence from animal models,[18-20] theo­retical models,[21,22] and empirical data, loading forces are considered catalysts for initiating the degener­ative process and for disease progression. The theory is that if the biomechanical loading forces that cause the initial tissue damage are not removed, the new biological replacement tissue will break down as well. Since knee OA is a progressive disease, those with mild to moderate disease have the greatest potential to benefit from conservative interventions aimed at slowing disease progression by altering the biomechanical environment. Researchers have exam­ined knee joint biomechanics and muscle activation patterns using gait as the model [21,22,24-26] to understand the mechanical loading environment in knee OA. But only recently have researchers begun to study these characteristics in patients with less advanced OA and across the severity spectrum. [25-30] This information is necessary for developing and evaluating treatments as well as for determining which changes are predictive of faster progression. The medial tibiofemoral compartment is often the main knee compartment afflicted with OA. [31,32] Only one study to date has found the peak knee adduction moment during walking, a surrogate measure of medial compartment loading, was predictive of knee OA progression, but numerous cross-sectional studies have related alterations in knee adduction moment characteristics to knee OA severity. [25,30,33,34] This has led to development of inter­ventions such as heel wedges and knee braces that attempt to reduce knee adduction moment characteristics. These recent cross-sectional studies are also showing that other biomechanical and muscle activation characteristics reflecting the dynamic loading environment of the knee joint are associated with disease severity, including frontal, sagittal, and transverse plane mechanics,[25,26,30,33] and muscle coactivation and imbalances. [29,36-38] This research implies the effectiveness of conservative interventions should perhaps not be based solely on their effect on a single mechanical variable: the peak knee adduction moment. Despite OA management guidelines recommending interventions that alter the knee mechanical environment,[14,15,39-41] new research has found that physicians treat patients with OA by prescribing medications for pain and inflammation or referring for surgical interventions rather than prescribing treatments that address the underlying mechanisms of disease progression. Unloader bracing is one conservative management intervention that has potential to alter the mechanical loading environment of the knee joint, yet is underutilized. [41,43] Beaudreuil et al  provide an excellent review of the evidence supporting unloader braces, identifying two areas in need of research. One relates to improving understanding of the biomechanical mechanisms for brace effects, given that inconsistent findings have been presented in the literature; the other determining optimal duration (dose) for brace wear. Biomechanical studies are varied with respect to population and brace type, but improvements in pain [47,51,53-60] and func­tion [51,52,56,58,59,61] associated with brace wear have consistently been reported in the literature. Unfortunately, little attention has been given to studying mechanical alterations in other planes or muscle characteristics that can impact joint loading. This is important, as it may provide additional information about the mechanism by which the brace works. 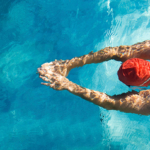 Different theories are emerging, in particular, those focusing on the role of the neuro­muscular system. In a small sample of individuals with medial compartment knee OA, Ramsey et al found that muscle co-contraction was significantly reduced in early stance phase with the use of neutral alignment and valgus unloader braces (4° of valgus alignment) during walking. Based on these results, the researchers hypothesized that the positive effects of braces could be due to increased stabilization, reducing the need for muscle co-contraction. Improved proprio­ception has also been reported with the use of valgus unloader braces, supporting the theory that bracing has a neuromuscular effect. In addition, Matsuno et al  reported increased quadriceps strength with prolonged brace wear that was accompanied by a decrease in tibiofemoral angle and a concomitant increase in medial joint space. They hypothesized this mechanical change was due to improved knee stability, supporting the mechanism proposed by Ramsey et al. Ramsey and Russell  also evaluated the evidence supporting the use of valgus unloader braces, and while they presented a more positive case for frontal plane alterations than Beaudreuil et al, they indicated that more work is needed to understand the effectiveness of braces on the neuromuscular system. 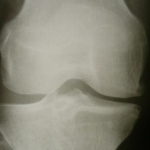 Part of the reason valgus unloader braces are under-prescribed in the conservative management of knee OA may relate to ambi­guity in prescription instructions. Brace prescription in the research literature has been highly variable, with study participants told to “wear the brace as often as possible,” [50,54,59] “wear on a regular basis,”  “wear for as many hours and for as many days of the week as they wished,”  “wear during ambulation,”  “wear for bother­some activities,”  “wear brace as instructed by physiother­apist or orthopaedic technician,” [46,61] and “wear for prolonged standing and sport.”  In addition to the varied instruction to patients, few studies report the actual duration of brace wear, making it difficult to ascertain the optimal prescription for benefit, and whether there is an amount of brace wear that may be ineffective or even detrimental. One area of concern for clinicians is the belief that long-duration brace use will result in decreased muscle strength. This thought is primarily driven from the literature on functional knee bracing for anterior cruciate ligament injury. Functional knee braces have been associated with thigh muscle atrophy, decreased hamstring performance, decreased quadriceps torque, and premature muscle fatigue. Researchers have hypothesized that muscle impairment is a result of the brace straps causing external compres­sion on the muscles, decreasing blood flow and resulting in poor tissue oxygenation. Decreases in knee joint muscle strength  and increased fatigue  would be detrimental in patients with knee OA, as both have been found to negatively impact knee joint mechanics, in particular the knee adduction moment, during walking. So the question is whether the length of time the brace is worn per day would have an impact on outcomes, and on muscle strength in particular. To look at the effect of bracing, a more realistic study design may be to have patients record how long they wear the brace and base dose response on the variability of wear times. We used this approach to examine dose response for muscle strength. We asked 24 patients with medial compartment knee OA with Kellgren-Lawrence severity scores ranging from 1 to 4 (out of 5) to wear customized valgus unloader braces “as needed” and record daily hours of brace wear and physical activity (step count measured by pedometer) for six months. These patients were not on a wait list for total knee arthroplasty and met functional criteria  (self-reported ability to walk a city block, jog five meters, and climb a flight of 10 stairs in a reciprocal manner). Average brace wear duration was approximately five hours per day, but there was a wide range (0-14 hours/day). We measured pain, function (subjective and objective), and lower extremity strength at baseline and follow up and determined relationships between changes in these variables and duration of brace wear. Although not statistically significant, increases of 5% to 13% for four quadriceps and hamstring strength measures were found at six months. Positive relationships were found between duration of brace wear and change in both physical activity and hamstrings muscle strength: the longer the brace was worn, the greater the activity and strength increases. However, the positive relationship between brace-wear dose response and the hamstring strength increase was weak. What may be more important is that longer brace wear duration was not associated with decreased strength over the six-month follow-up period. The lack of decreased muscle strength with high brace use is consistent with the findings of Matsuno et al, the only other study looking at the effect of valgus knee bracing on quadriceps muscle strength. This study, however, was in a more advanced, weaker, and older OA group who wore the brace for long daily durations (al­though actual times were not reported). Interestingly, our work showed that subjective pain and function improved between baseline and follow up, consistent with the literature,[47,51-61] yet there was no dose response for these variables. Regardless of how little the brace was worn, perceived pain and function improved, although objective measures of function (walking velocity) did not. This finding, combined with the positive relationship between brace wear dose and change in physical activity, suggests that there may be different patient-specific strategies for wearing the brace. Our study included younger participants with less severe disease than the study Matsuno et al, but the brace wear use was varied, with the longer wear times reported for the older patients with more severe disease and less active participants. The more active people tended to wear the brace less, perhaps only wearing it for specific activities. Conversely, the less active people tended to wear the brace more and the result was an increase in their physical activity levels. Only two biomechanics studies have asked participants to record their hours of daily brace wear; these reported mean brace wear durations and standard deviations of 6.9 (4.6)  and 9 (5)  hours per day. Hewett et al  did not find a change in knee adduction moment after six months of brace wear, whereas Draganich et al  found reduced knee adduction moments after only five weeks. This difference is not likely due to the two-hour difference in brace wear per day, but may be related to the severity of OA in the Hewett study. 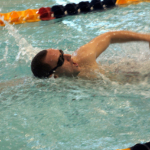 Hewett’s participants were young, with a mean age of 41 years, and the majority had had a previous injury. Draganich’s study participants were closer in age (50 years) to our study participants, and we included those with primary OA (i.e., not those with OA secondary to an injury). The findings of these two biomechanical studies, in addition to our study on dose response, suggest that higher brace wear times do not negatively impact muscle strength or knee adduction moment parameters. We are presently expanding our dose-response analysis to include 3D kinematic and kinetic dynamic waveform data and muscle activation patterns to better understand joint loading throughout the gait cycle. Preliminary findings suggest that changes in specific variables are related to brace wear time. This information will improve our understanding of whether there is an optimal wear time for positive mechanical results. In addition to looking at dose response of the valgus unloader brace, an important piece of the puzzle is determining which pa­tients are the best candidates for bracing. The variability in response to braces in our study and others implies that there are responders and nonresponders; identifying these individuals and their dose response patterns would be valuable. Preliminary work from our laboratory has shown that not all individuals respond with a reduced knee adduction moment follow­ing brace application. Some individuals experience decreased knee adduction moments during walking with a brace, while others have increased knee adduction moments. These differential effects were found in the first two weeks of wearing the valgus unloader brace. Superficially, this might indicate that the brace may actually worsen the mechanical loading environment at the knee in some subgroups. However, the knee adduction moment magnitude does not provide the entire story with respect to the joint loading environment. A comprehensive 3D motion and force analysis, along with the muscle activation patterns, will provide more complete information. Follow-up studies are needed to determine whether the different responses persist over time and, if so, whether we can identify subgroups of responders and nonresponders with respect to symptoms, joint mechanical characteristics, and structural pro­gression. Despite numerous studies showing that valgus unloader braces improve symptoms and evidence that they alter the mechanical environment of the knee, this conservative management option remains underutilized in knee OA management, perhaps because of ambiguity in prescription parameters or concerns about muscle impairment with prolonged use. While more dose-response studies are needed to determine the optimal duration of brace wear and the effects of bracing on the mechanical loading environment of the knee joint, the available literature indicates that, in terms of pain, function, activity, and muscle strength, there is potential benefit and no harm in wearing the brace as needed, even for prolonged periods of time. Cheryl Hubley-Kozey PhD is a professor in the schools of Physio­therapy and Biomedical Engineering at Dalhousie University in Halifax, Canada, whose research focus is on improving function of those with musculoskeletal conditions. 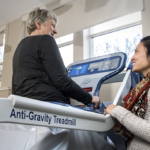 Gillian Hatfield Murdock PT MSc is a physiotherapist and doctoral candidate in the School of Biomedical Engineering at Dalhousie who is interested in the rela­tion­ship between physical activity and knee OA progression. Acknowledgements: Canadian Institutes of Health and Nova Scotia Health Research Foundation. OARSI-FDA initiative: defining the disease state of osteoarthritis, Lane NE, Brandt K, Hawker G, Peeva E, Schreyer E, Tsuji W, Hochberg MC. Osteoarthritis Cartilage. 2011 May;19(5):478-82. doi: 10.1016/j.joca.2010.09.013. Epub 2011 Mar 23. Estimates of the prevalence of arthritis and other rheumatic conditions in the United States. Part I, Helmick CG, Felson DT, Lawrence RC, Gabriel S, Hirsch R, Kwoh CK, Liang MH, Kremers HM, Mayes MD, Merkel PA, Pillemer SR, Reveille JD, Stone JH; National Arthritis Data Workgroup. Arthritis Rheum. 2008 Jan;58(1):15-25. doi: 10.1002/art.23177. Yet more evidence that osteoarthritis is not a cartilage disease, Brandt KD, Radin EL, Dieppe PA, van de Putte L. Ann Rheum Dis. 2006 Oct;65(10):1261-4. Medical care expenditures and earnings losses among persons with arthritis and other rheumatic conditions in 2003, and comparisons with 1997, Yelin E, Murphy L, Cisternas MG, Foreman AJ, Pasta DJ, Helmick CG. Arthritis Rheum. 2007 May;56(5):1397-407. Osteoarthritis, Hunter DJ, Felson DT. BMJ. 2006 Mar 18;332(7542):639-42. Review. NIH Consensus Statement on total knee replacement, NIH Consens State Sci Statements. 2003 Dec 8-10;20(1):1-34. The increasing need for nonoperative treatment of patients with osteoarthritis, Buckwalter JA, Stanish WD, Rosier RN, Schenck RC Jr, Dennis DA, Coutts RD. Clin Orthop Relat Res. 2001 Apr;(385):36-45. Review..
Do NSAIDs affect longitudinal changes in knee cartilage volume and knee cartilage defects in older adults? Ding C, Cicuttini F, Jones G. Am J Med. 2009 Sep;122(9):836-42. doi: 10.1016/j.amjmed.2009.03.022. Is there an association between the use of different types of nonsteroidal antiinflammatory drugs and radiologic progression of osteoarthritis? The Rotterdam Study. Reijman M, Bierma-Zeinstra SM, Pols HA, Koes BW, Stricker BH, Hazes JM. Arthritis Rheum. 2005 Oct;52(10):3137-42. Increased joint loads during walking–a consequence of pain relief in knee osteoarthritis, Henriksen M, Simonsen EB, Alkjaer T, Lund H, Graven-Nielsen T, Danneskiold-Samsøe B, Bliddal H. Knee. 2006 Dec;13(6):445-50. Epub 2006 Sep 29. Knee pain and joint loading in subjects with osteoarthritis of the knee, Hurwitz DE, Ryals AR, Block JA, Sharma L, Schnitzer TJ, Andriacchi TP. J Orthop Res. 2000 Jul;18(4):572-9. OARSI recommendations for the management of hip and knee osteoarthritis, Part II: OARSI evidence-based, expert consensus guidelines, Zhang W, Moskowitz RW, Nuki G, Abramson S, Altman RD, Arden N, Bierma-Zeinstra S, Brandt KD, Croft P, Doherty M, Dougados M, Hochberg M, Hunter DJ, Kwoh K, Lohmander LS, Tugwell P. Osteoarthritis Cartilage. 2008 Feb;16(2):137-62. doi: 10.1016/j.joca.2007.12.013. Review. OARSI recommendations for the management of hip and knee osteoarthritis: part III: Changes in evidence following systematic cumulative update of research published through January 2009, Zhang W, Nuki G, Moskowitz RW, Abramson S, Altman RD, Arden NK, Bierma-Zeinstra S, Brandt KD, Croft P, Doherty M, Dougados M, Hochberg M, Hunter DJ, Kwoh K, Lohmander LS, Tugwell P. Osteoarthritis Cartilage. 2010 Apr;18(4):476-99. doi: 10.1016/j.joca.2010.01.013. Epub 2010 Feb 11. Review. Experience with a placebo-controlled randomized clinical trial of a disease-modifying drug for osteoarthritis: the doxycycline trial, Brandt KD, Mazzuca SA. Rheum Dis Clin North Am. 2006 Feb;32(1):217-34, xi-xii. Chitosan-glycerol phosphate/blood implants elicit hyaline cartilage repair integrated with porous subchondral bone in microdrilled rabbit defects, Hoemann CD, Sun J, McKee MD, Chevrier A, Rossomacha E, Rivard GE, Hurtig M, Buschmann MD. Osteoarthritis Cartilage. 2007 Jan;15(1):78-89. Epub 2006 Aug 8. Effects of mechanical loading on the tissues of the rabbit knee, Radin EL, Martin RB, Burr DB, Caterson B, Boyd RD, Goodwin C. J Orthop Res. 1984;2(3):221-34. Morphologic and morphometric changes in synovial membrane associated with mechanically induced osteoarthrosis, Walker ER, Boyd RD, Wu DD, Lukoschek M, Burr DB, Radin EL. Arthritis Rheum. 1991 May;34(5):515-24. Neurogenic factors in the etiopathogenesis of osteoarthritis, O’Connor BL, Brandt KD. Rheum Dis Clin North Am. 1993 Aug;19(3):581-605. Review. A framework for the in vivo pathomechanics of osteoarthritis at the knee, Andriacchi TP, Mündermann A, Smith RL, Alexander EJ, Dyrby CO, Koo S. Ann Biomed Eng. 2004 Mar;32(3):447-57. Review. The role of ambulatory mechanics in the initiation and progression of knee osteoarthritis, Andriacchi TP, Mündermann A. Curr Opin Rheumatol. 2006 Sep;18(5):514-8. Review. Dynamic load at baseline can predict radiographic disease progression in medial compartment knee osteoarthritis, Miyazaki T, Wada M, Kawahara H, Sato M, Baba H, Shimada S. Ann Rheum Dis. 2002 Jul;61(7):617-22. Muscle co-activation patterns during walking in those with severe knee osteoarthritis, Hubley-Kozey C, Deluzio K, Dunbar M. Clin Biomech (Bristol, Avon). 2008 Jan;23(1):71-80. Epub 2007 Nov 1. Gait and neuromuscular pattern changes are associated with differences in knee osteoarthritis severity levels, Astephen JL, Deluzio KJ, Caldwell GE, Dunbar MJ, Hubley-Kozey CL. J Biomech. 2008;41(4):868-76. Epub 2008 Feb 20. Differences in gait parameters between healthy subjects and persons with moderate and severe knee osteoarthritis: a result of altered walking speed? Zeni JA Jr, Higginson JS. Clin Biomech (Bristol, Avon). 2009 May;24(4):372-8. doi: 10.1016/j.clinbiomech.2009.02.001. Epub 2009 Mar 13. Erratum in: Clin Biomech (Bristol, Avon). 2009 Jul;24(6):532. Knee biomechanics of moderate OA patients measured during gait at a self-selected and fast walking speed, Landry SC, McKean KA, Hubley-Kozey CL, Stanish WD, Deluzio KJ. J Biomech. 2007;40(8):1754-61. Epub 2006 Nov 7. Neuromuscular alterations during walking in persons with moderate knee osteoarthritis, Hubley-Kozey CL, Deluzio KJ, Landry SC, McNutt JS, Stanish WD. J Electromyogr Kinesiol. 2006 Aug;16(4):365-78. Epub 2005 Oct 4..
Co-activation differences in lower limb muscles between asymptomatic controls and those with varying degrees of knee osteoarthritis during walking, Hubley-Kozey CL, Hill NA, Rutherford DJ, Dunbar MJ, Stanish WD. Clin Biomech (Bristol, Avon). 2009 Jun;24(5):407-14. doi: 10.1016/j.clinbiomech.2009.02.005. Epub 2009 Mar 19. Erratum in: Clin Biomech (Bristol, Avon). 2009 Jul;24(6):529. Knee joint loading differs in individuals with mild compared with moderate medial knee osteoarthritis, Thorp LE, Sumner DR, Block JA, Moisio KC, Shott S, Wimmer MA. Arthritis Rheum. 2006 Dec;54(12):3842-9. Osteoarthrosis of the knee. A radiographic investigation, Ahlbäck S. Acta Radiol Diagn (Stockh). 1968:Suppl 277:7-72. Biomechanical changes at the hip, knee, and ankle joints during gait are associated with knee osteoarthritis severity, Astephen JL, Deluzio KJ, Caldwell GE, Dunbar MJ. J Orthop Res. 2008 Mar;26(3):332-41. Secondary gait changes in patients with medial compartment knee osteoarthritis: increased load at the ankle, knee, and hip during walking, Mündermann A, Dyrby CO, Andriacchi TP. Arthritis Rheum. 2005 Sep;52(9):2835-44. Noninvasive devices targeting the mechanics of osteoarthritis, Gross KD, Hillstrom HJ. Rheum Dis Clin North Am. 2008 Aug;34(3):755-76. doi: 10.1016/j.rdc.2008.06.001. Review. The association between knee joint biomechanics and neuromuscular control and moderate knee osteoarthritis radiographic and pain severity, Astephen Wilson JL, Deluzio KJ, Dunbar MJ, Caldwell GE, Hubley-Kozey CL. Osteoarthritis Cartilage. 2011 Feb;19(2):186-93. doi: 10.1016/j.joca.2010.10.020. Epub 2010 Nov 11. Alterations in quadriceps and hamstrings coordination in persons with medial compartment knee osteoarthritis, Zeni JA, Rudolph K, Higginson JS. J Electromyogr Kinesiol. 2010 Feb;20(1):148-54. doi: 10.1016/j.jelekin.2008.12.003. Clinical practice. Osteoarthritis of the knee, Felson DT. N Engl J Med. 2006 Feb 23;354(8):841-8. Review. Erratum in: N Engl J Med. 2006 Jun 8;354(23):2520. Recommendations for the medical management of osteoarthritis of the hip and knee: 2000 update. American College of Rheumatology Subcommittee on Osteoarthritis Guidelines, [No authors listed] Arthritis Rheum. 2000 Sep;43(9):1905-15. No abstract available. Clinical practice guidelines for rest orthosis, knee sleeves, and unloading knee braces in knee osteoarthritis, Beaudreuil J, Bendaya S, Faucher M, Coudeyre E, Ribinik P, Revel M, Rannou F. Joint Bone Spine. 2009 Dec;76(6):629-36. doi: 10.1016/j.jbspin.2009.02.002. Review. Osteoarthritis, Hunter DJ. Best Pract Res Clin Rheumatol. 2011 Dec;25(6):801-14. doi: 10.1016/j.berh.2011.11.008. Review. OA knee bracing in family practice, Hand L. Lower Extremity Review 2011;3(12):70. Reduction of medial compartment loads with valgus bracing of the osteoarthritic knee, Pollo FE, Otis JC, Backus SI, Warren RF, Wickiewicz TL. Am J Sports Med. 2002 May-Jun;30(3):414-21. The effect of valgus bracing on the knee adduction moment during gait and running in male subjects with varus alignment, Fantini Pagani CH, Potthast W, Brüggemann GP. Clin Biomech (Bristol, Avon). 2010 Jan;25(1):70-6. doi: 10.1016/j.clinbiomech.2009.08.010. A mechanical theory for the effectiveness of bracing for medial compartment osteoarthritis of the knee, Ramsey DK, Briem K, Axe MJ, Snyder-Mackler L. J Bone Joint Surg Am. 2007 Nov;89(11):2398-407. Joint loading with valgus bracing in patients with varus gonarthrosis, Lindenfeld TN, Hewett TE, Andriacchi TP. Clin Orthop Relat Res. 1997 Nov;(344):290-7. A biomechanical analysis of a medial unloading brace for osteoarthritis in the knee, Self BP, Greenwald RM, Pflaster DS. Arthritis Care Res. 2000 Aug;13(4):191-7. Effects of unloading bracing on knee and hip joints for patients with medial compartment knee osteoarthritis, Toriyama M, Deie M, Shimada N, Otani T, Shidahara H, Maejima H, Moriyama H, Shibuya H, Okuhara A, Ochi M. Clin Biomech (Bristol, Avon). 2011 Jun;26(5):497-503. doi: 10.1016/j.clinbiomech.2011.01.003. Epub 2011 Feb 16. The effectiveness of self-adjustable custom and off-the-shelf bracing in the treatment of varus gonarthrosis, Draganich L, Reider B, Rimington T, Piotrowski G, Mallik K, Nasson S. J Bone Joint Surg Am. 2006 Dec;88(12):2645-52. Valgus bracing in patients with medial compartment osteoarthritis of the knee. A gait analysis study of a new brace, Gaasbeek RD, Groen BE, Hampsink B, van Heerwaarden RJ, Duysens J. Gait Posture. 2007 Jun;26(1):3-10. Epub 2006 Sep 7. Decrease in knee joint pain and increase in function in patients with medial compartment arthrosis: a prospective analysis of valgus bracing, Hewett TE, Noyes FR, Barber-Westin SD, Heckmann TP. Orthopedics. 1998 Feb;21(2):131-8. Valgus knee bracing for medial gonarthrosis, Horlick SG, Loomer RL. Clin J Sports Med 1993;3(4):251-255. Generation II knee bracing for severe medial compartment osteoarthritis of the knee, Matsuno H, Kadowaki KM, Tsuji H. Arch Phys Med Rehabil. 1997 Jul;78(7):745-9. Change of bone mineral density with valgus knee bracing, Y Katsuragawa, N Fukui, K Nakamura. The effect of bracing on varus gonarthrosis, Kirkley A, Webster-Bogaert S, Litchfield R, Amendola A, MacDonald S, McCalden R, Fowler P. J Bone Joint Surg Am. 1999 Apr;81(4):539-48. An in vivo analysis of the effectiveness of the osteoarthritic knee brace during heel-strike of gait, Komistek RD, Dennis DA, Northcut EJ, Wood A, Parker AW, Traina SM. J Arthroplasty. 1999 Sep;14(6):738-42. Effect of CounterForce brace on symptomatic relief in a group of patients with symptomatic unicompartmental osteoarthritis: a prospective 2-year investigation, Barnes CL, Cawley PW, Hederman B. Am J Orthop (Belle Mead NJ). 2002 Jul;31(7):396-401. 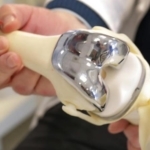 Evaluation of off-loading braces for treatment of unicompartmental knee arthrosis, Dennis DA, Komistek RD, Nadaud MC, Mahfouz M. J Arthroplasty. 2006 Jun;21(4 Suppl 1):2-8. Brace treatment for osteoarthritis of the knee: a prospective randomized multi-centre trial, Brouwer RW, van Raaij TM, Verhaar JA, Coene LN, Bierma-Zeinstra SM. Osteoarthritis Cartilage. 2006 Aug;14(8):777-83. Epub 2006 Mar 24. Knee bracing for medial compartment osteoarthritis: effects on proprioception and postural control, Birmingham TB, Kramer JF, Kirkley A, Inglis JT, Spaulding SJ, Vandervoort AA. Rheumatology (Oxford). 2001 Mar;40(3):285-9. Unloader braces for medial compartment knee osteoarthritis: implications on mediating progression, Ramsey DK, Russell ME, Sports Health. 2009 Sep;1(5):416-26..
Kinematics of valgus bracing for medial gonarthrosis: technical report, Davidson PL, Sanderson DJ, Loomer RL. Clin Biomech (Bristol, Avon). 1998 Sep;13(6):414-419. The effect of knee bracing after anterior cruciate ligament reconstruction. A prospective, randomized study with two years’ follow-up, Risberg MA, Holm I, Steen H, Eriksson J, Ekeland A. Am J Sports Med. 1999 Jan-Feb;27(1):76-83. Anterior cruciate ligament functional brace use in sports, Wojtys EM, Kothari SU, Huston LJ. Am J Sports Med. 1996 Jul-Aug;24(4):539-46. Leg muscle performance of athletes with and without knee support braces, Houston ME, Goemans PH. Arch Phys Med Rehabil. 1982 Sep;63(9):431-2. The effects of functional knee bracing on muscle function and performance, Styf J. Sports Med. 1999 Aug;28(2):77-81. Review. Knee strength and knee adduction moments following arthroscopic partial meniscectomy, Sturnieks DL, Besier TF, Hamer PW, Ackland TR, Mills PM, Stachowiak GW, Podsiadlo P, Lloyd DG. Med Sci Sports Exerc. 2008 Jun;40(6):991-7. doi: 10.1249/MSS.0b013e318167812a. Effect of a high intensity quadriceps fatigue protocol on knee joint mechanics and muscle activation during gait in young adults, Murdock GH, Hubley-Kozey CL. Eur J Appl Physiol. 2012 Feb;112(2):439-49. doi: 10.1007/s00421-011-1990-4. Epub 2011 May 15. Is there a dose response for valgus unloader brace usage on knee pain, function, and muscle strength? Hurley ST, Hatfield Murdock GL, Stanish WD, Hubley-Kozey CL. Arch Phys Med Rehabil. 2012 Mar;93(3):496-502. doi: 10.1016/j.apmr.2011.09.002. Epub 2012 Jan 12. Muscle dysfunction and effective rehabilitation of knee osteoarthritis: what we know and what we need to find out, Hurley MV. Arthritis Rheum. 2003 Jun 15;49(3):444-52. Review. Load-shifting brace treatment for osteoarthritis of the knee: a minimum 2 1/2-year follow-up study, Giori NJ. J Rehabil Res Dev. 2004 Mar;41(2):187-94.. Long-term results of an unloader brace in patients with unicompartmental knee osteoarthritis, Wilson B, Rankin H, Barnes CL. Orthopedics. 2011 Aug 8;34(8):e334-7. doi: 10.3928/01477447-20110627-07..